The default timezone of the website is set to GMT, and if you live in parts of the world with different time zones (CET for instance), you will be shown erroneous dates and times across the website. For instance, the date and time on which you, or somebody else wrote a forum post, uploaded a screenshot or added a comment will be displayed erroneously (the wrong date and time) in places such as the forum threads or the activity feed on the main page. Hover the cursor over your username found on the top bar, and a drop down menu will pop up, now click on "Options". 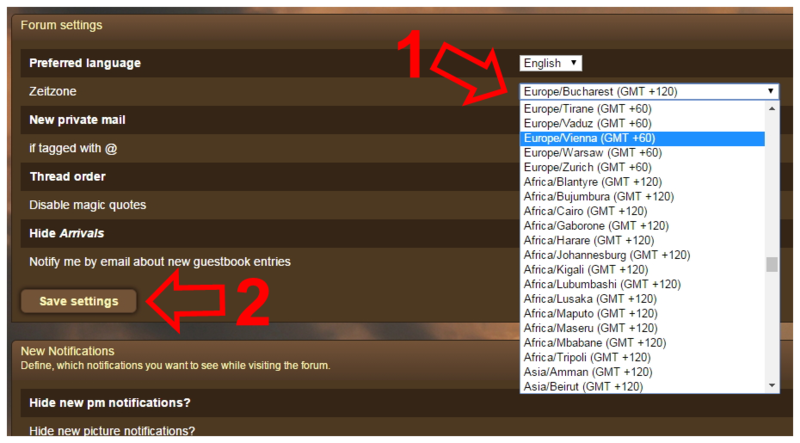 On the "Settings" panel you've been presented with, click on "Forum Settings"
On the first of the 2 panels that have showed up, there is an option labeled "Zeitzone", the German word for "Timezone", click on its corresponding button to open the drop down menu and from that list, select the city that has the same timezone as your location. Next, click on the button labeled "Save settings" of this panel. Now you should have correct values of date and time displayed across the site.